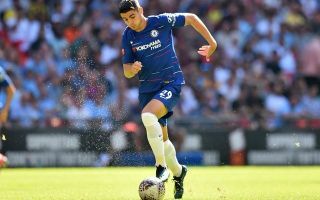 Former Manchester City defender Richard Dunne didn’t hold back in his analysis of Chelsea forward Alvaro Morata’s display during the Community Shield clash with his old club. In a game where Morata could have proven his doubters wrong ahead of the new season to get off to a positive start, the former Real Madrid man disappointed. With that in mind, Dunne was scathing in his thoughts on the 25-year-old, as seen in the video below. "Morata was a disgrace up front, he was awful." It seems obvious that the forward is severely struggling for confidence and Chelsea will hope he has a turn of good fortune very soon as he looks set to lead the line for the Blues this year. After scoring just 15 goals in 48 appearances in all competitions last season, the Spaniard will face increased pressure this time round to show that he has improved and settled after 12 months in west London. Nevertheless, he also needs the service to do that, and it could be counter-argued that he lacked the support from his teammates needed to allow him to impress too. Rio Ferdinand added during his post match reaction – “As a centre back when you see Morata in front of you, he doesn’t scare you at all”. Ferdinand’s comments also came after the former United man heaped praise on Sergio Aguero following his sensational performance. “Aguero is the best striker in the Premier League. I’d take him ahead of Kane”. Dunne wasn’t the only onlooker to lambast Morata for his performance, with the fans below reacting to the uninspiring performance. Aguero is such a proper striker, gets behind the defenders and makes sensible runs. Morata lacks that attacking sense and mobility of a striker. Morata is just bang average. Never seen a striker fall so much when trying to to hold up the ball. You can't lead the line, if you don't have that killer instinct. Imagine Chelsea paid £60m for Morata, a striker who had never lead the line on his own or played as main striker for an entire season, never scored 20+ goals, and now are surprised that he doesn't look like a 20+ goal striker who can lead the line on his own. Chelsea’s most alarming area of weakness appears to be up front and with little time left in the transfer window, they are arguably in desperate need of better centre-forward options. Morata has had ample chances to prove himself and still hasn’t, and so perhaps a clinical striker will need to be brought in if Chelsea want to stand a chance of achieving any kind of success this season.